As Waldron and Shabbir point out, while microfinance organizations (MFIs) typically provide financing of this size to low income people, the financial service providers lack expertise in sanitation or construction. MFIs usually provide business loans so that a borrower will have the opportunity to invest in a business with profits to repay the loan. While a water connection will provide a family with long term savings in term of health and time, it will not provide cashflows. Back in 2014 when Whole Planet Foundation’s partner in Indonesia, KOMIDA, found that 40% of their own clients lacked a toilet, they wanted to address sanitation specifically as part of their social mission. KOMIDA partnered with water.org for technical assistance to create a loan product adapted for their members and to train staff about how to promote and monitor its implementation. Water.org has 25 years of experience in the sanitation sector, working in 12 different countries. Water.org partners, including KOMIDA, have disbursed over 2.9 million total loans for 10,256 borrowers as of September 2018, with a repayment rate above 99%! The partnership with KOMIDA has created a new Sanitation loan product which is specially designed to make it more affordable for members. Clients can only take a water sanitation loan after 1 year of membership. This means that the water sanitation loan will be paired with the client’s established business. Interest rates are cheaper than the business loan and processing fee is waived. The loan term can be extended up to 2 years, keeping the weekly installment size small and manageable. Whole Planet Foundation has partnered with KOMIDA over three partnerships to support their business loan. Now in our fourth project together, the foundation's board has approved approximately $636,000 USD for scaling up the water/sanitation product at the nine branches that fall under our partnership. The special modifications that KOMIDA made to make the product more affordable for clients means that it brings in less revenue. At the same time, it requires more staff time and effort for promotion and follow up. So the sanitation product is an expensive undertaking at KOMIDA. Therefore, Whole Planet Foudation's free capital subsidizes the cost of funds needed to finance this product. When KOMIDA members take the sanitation loan, they can apply it depending on water connection availability in their area and their budget. For example, outside a city, it may not be an option to connect to a piped water system. Most clients I visited were investing in a toilet + bathroom + septic tank package. For example, KOMIDA client, Wahyu, pictured at the top of this post, is a member of the Lhong Raya Branch outside Banda Aceh. She has previously borrowed from KOMIDA to finance her sewing/tailor business. 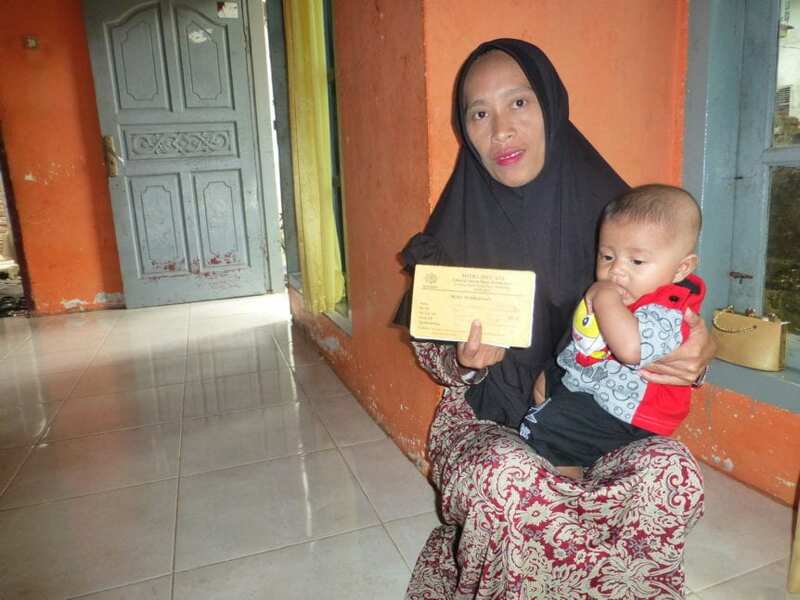 She also borrowed 6 million IDR (≈$400) from KOMIDA for a toilet and septic tank which she is repaying in small weekly installments over a two year period. For Wahyu’s family, the financing made it possible to build their own toilet. According to KOMIDA’s research, now 73% of their members have the ability to have their own toilet with a septic tank. by Claire Kelly, Whole Planet Foundation’s Regional Director for Asia and the Pacific. Learn more about how Whole Plane Foundation brings the benefits of microcredit to Asia and the Pacific.